QueenOnline Message Board • View topic - The Alternate Football Thread. Re: The Alternate Football Thread. Bad Guy wrote: OH. MY. GOD. What a night. Absolutely buzzing. I f*cking love football. Yep. Went more in hope than expectation. Actually had tears in my eyes at the end. Never thought I'd see us beat one of the Old Firm, never mind in their own stadium! Nights like last night make supporting a diddy team worthwhile! I emember watching on TV when we beat Arsenal at The Emirates. I was almost sick, I was so excited. Back to league business today. Away to Dundee. Got a feeling we'll come back down to earth with a bump!! Bad Guy wrote: Back to league business today. Away to Dundee. Got a feeling we'll come back down to earth with a bump!! that's football for you. It is why we love the game and our team. Yep. Lost 3-1 and now bottom of the league. Def back down to earth with a bump!!! Got to feel sorry for Cloughie, he's told to half the wage bill at Derby, which he did, spend very little money, which he did, keep Derby in the Championship, which he did, and then they go and sack him and bring back the Wally with the Brolly, Derby fans that i know are not happy. MaClaren has started well at Derby, their fans are quite excited again. Last edited by icy on Tue Jan 21, 2014 1:33 pm, edited 1 time in total. 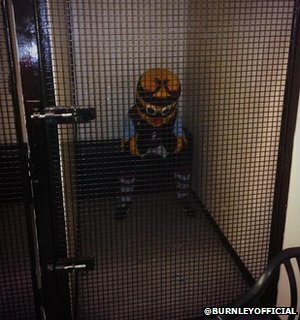 Burnleys mascot got sent off today for handing the linesman a pair of glasses. Most enjoyable football game I've watched in ages!